A good gun holster should hold your gun when you want it to and release your gun when you want it to. A good gun holster shouldn’t get in the way, but it should always be there when you need it. Whether you need a shoulder holster, and ankle holster, a belt holster, a thigh holster, or even a pocket holster, the manufacturers we recommend here will be able to supply you with a quality product which will meet and exceed your requirements. Bianchi International is recognized by shooting enthusiasts and professionals as the largest leading designer/manufacturer of innovative, high quality handgun holsters and accessories. The company was started by John Bianchi forty-five years ago, who was then a full time police officer in Southern California. Over the years, the company grew to worldwide prominence through its innovative holster designs and John’s ingenious, and sometimes unconventional marketing strategies. Although Bianchi retired several years ago from the company he founded, his mark is left on a wide range of increasingly diversified and unique Bianchi holsters and accessories, available worldwide. Now as then, the Bianchi vision and commitment to innovative product design and handcrafting with the utmost care from the finest materials, continue to set new standards in the industry. Headquartered in Temecula, California, the Bianchi International complex includes more than 70,000 square feet of research, design, development, manufacturing and support facilities. Fueled by continuing growth, an additional 40,000 square foot manufacturing facility is located in Imperial Valley, California. Bianchi’s primary markets are law enforcement, military and sporting; and its products are sold globally through dealers and distributors. Bianchi’s many patented innovations have aggressively and consistently set the pace in holster technology. It was Bianchi’s heritage and tradition in leather holsters and accessories that put the company on the map. 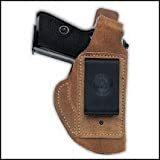 Yet, while Bianchi’s reputation for exceptional leather products prevails, Bianchi history also includes revolutionary holster design in ballistic weave nylon and other high-performance man-made materials. Bianchi is capable of filling large order requirements on tight schedules, while employing the most advanced production and quality assurance techniques in the industry. For over thirty years the law enforcement community has relied upon DeSantis because our products are much more than just good looking – they work! For this reason, our products have earned a worldwide reputation for dependability from the inner city drug raids and jungles of Central and South America to the deserts of the Middle East. DeSantis’ holsters are the first choice of the FBI, Secret Service, the U.S. Air Marshal Service, and numerous departments and agencies all over the globe. In 1983 my Korean born wife Soon Ja, suggested that we turn my hobby into a part time business. Although we are no longer a “one man shop” in the garage, our basic philosophy remains the same. Soon Ja and I both realize that someone’s life may depend upon the products that we sell. We want our holsters to be the finest gun leather available. We want to provide you with a level of customer service that make you feel good doing business with our company. We want you to be thoroughly and completely satisfied with your experience at Kramer Handgun Leather. Allison P. “Uncle Mike” Michaels founded Michaels of Oregon in 1947 when he began manufacturing sling swivels for the gunsmith trade. Starting out in his home, Uncle Mike also made such items as triggerguards and floorplates for conversions of military rifles, but his main stock in trade was swivels. Michaels of Oregon became an entirely different company when, in 1982, the Sidekick holster was introduced, putting the company into the handgun accessory business for the first time. In what became known as the “Nylon Holster Revolution,” the Sidekick holster soon displaced leather holsters as the primary vehicle for carrying a handgun. Blade-Tech products are very light and comfortable, making them practical for daily carry and training. Since Blade-Tech holsters are custom molded to each specific type of weapon, they have excellent retention qualities and provide for an extremely fast presentation. We use Modified Acrylic PVC Alloy Thermoplastics with high impact and abrasion resistant qualities. Impervious to most chemicals, solvents and oils, they are waterproof and have a permanent memory, retaining their molded shape indefinitely. These highly advanced thermoplastics will not shrink and are proven to withstand the harshest environments. They are stable from well below freezing to over 160 degrees Fahrenheit. In today’s world we offer equipment that can be washed clean or sterilized in the event of soiling from blood or other potentially dangerous fluids. Only the highest quality materials are used in Blade-Tech products. Additionally, they are manufactured with heavy gauge materials to provide added strength and durability . For the utmost in concealability our Deep Cover is constructed of premium horsehide, rough side out to provide excellent interior grip. It features leather sewn in sight rails and an injection molded nylon J hook that locks on to belt. Reinforced around the top opening to permit easy re-holstering. Available in right- or left-handed designs, in natural finish only. The Galco Waistband is constructed of premium glove tanned harness leather and is designed rough-side out. It features a reinforced thumb break as well as a unique injection molded nylon spring clip that locks on to belt or pants. 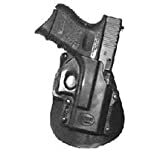 This holster can be used strong side, cross draw, or behind the hip. The Waistband is available in right- & left-handed designs, in tan finish only. Full grained vegetable tanned leather. 16 forward rake. Features Auto Retention. Pancake styling, comfortable concealable. Efficient, one step single plane draw. Internal locking mechanism. Fits up to 1.75″ belt loops. Premium, full grain leather. Minimalist design with hammer retainer tab. Belt slide design that snaps on and off waist belt for easy use. Suede lined with border stitching. Combat proven by Israeli Military. Injection molding to duplicate in leather or other material. Passive locking system. Contoured for maximum fit. Positive retention system. Wt: 2 oz. Rotates 360deg. Adjusts easily for cross-draw, bodyguard/driver/small-of-the-back & strong-side carries. Patented locking adjustment allows the firearm either forward or reverse cant with total gun retention. Lightweight, flexible, 2-piece design for maximum strength, all-day comfort. Includes easily interchangeable paddle or belt loop attachment. Ultra lightweight and comfortable for all day use. Adjustable strap for leg tension. Holds weapon securely.